In Canada and the United States, the term football usually refers to a ball made of cow hide leather, which is required in professional and collegiate football. Footballs used in recreation, and in organised youth leagues, may be made of rubber or plastic materials (the high school football rulebooks still allow the inexpensive all-rubber footballs, though they are less common than leather). Since 1941, Wilson  has been the exclusive supplier of leather for National Football League footballs. The arrangement was established by Arnold Horween, who had played and coached in the NFL. Horween Leather Company also supplies leather to Spalding, supplier of balls to the Arena Football League. In the CFL the stripes traverse the entire circumference of the ball. The UFL used a ball with lime-green stripes. The XFL used a novel color pattern, a black ball with red curved lines in lieu of stripes, for its footballs; this design was redone in a tan and navy color scheme for the Arena Football League in 2003. Two indoor American football leagues, the Ultimate Indoor Football League and American Indoor Football, use a ball with red, white and blue panels. Law 2 of the game specifies that the ball is an air-filled sphere with a circumference of 68–70 cm (27–28 in), a weight of 410–450 g (14–16 oz), inflated to a pressure of 0.6 to 1.1 atmospheres (60–111 kPa or 8.7–16.1 psi) "at sea level", and covered in leather or "other suitable material". The weight specified for a ball is the dry weight, as older balls often became significantly heavier in the course of a match played in wet weather. The standard ball is a Size 5, although smaller sizes exist: Size 3 is standard for team handball and Size 4 in futsal and other small-field variants. Other sizes are used in underage games or as novelty items. 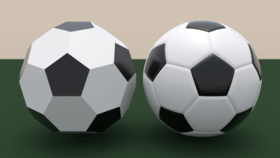 A truncated icosahedron (left) compared with an Association football. Most modern Association footballs are stitched from 32 panels of waterproofed leather or plastic: 12 regular pentagons and 20 regular hexagons. The 32-panel configuration is the spherical polyhedron corresponding to the truncated icosahedron; it is spherical because the faces bulge from the pressure of the air inside. The first 32-panel ball was marketed by Select in the 1950s in Denmark. This configuration became common throughout Continental Europe in the 1960s, and was publicised worldwide by the Adidas Telstar, the official ball of the 1970 World Cup. The familiar 32-panel football design is sometimes referenced to describe the truncated icosahedron Archimedean solid, carbon buckyballs or the root structure of geodesic domes. There are a number of different types of football balls depending on the match and turf including: training footballs, match footballs, professional match footballs, beach footballs, street footballs, indoor footballs, turf balls, futsal footballs and mini/skills footballs. Balls made by Irish company O'Neill's are used for all official Gaelic football matches. Gaelic football is played with a spherical leather ball, roughly 25 cm (9.8 in) in diameter and 69–74 cm (27–29 in) in circumference. A dry ball weighs between 370 and 425 g (13.1 and 15.0 oz). The pattern of panels is identical to the volleyball, consisting of six groups perpendicular to each other, each group being composed of two trapezoidal panels and one rectangular panel; 18 panels in all. 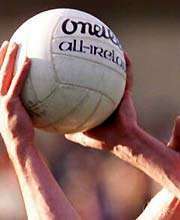 Gaelic footballs are also the standard balls used in international rules football. Gaelic football has been played with a round ball since the game was first organised in 1887, balls made by the Irish sports company O'Neills have been used since the company was founded in 1918 and are recognised as the official ball to be played with, although it is now permitted to use the ball manufactured by the Irish sports company Gaelic Gear. 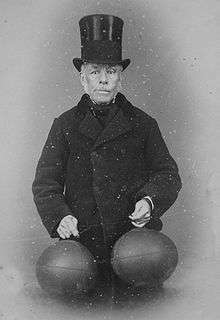 Richard Lindon in 1880, with two Rugby balls. A Steeden football as used in rugby league. The Australasian National Rugby League and European Super League use balls made by Steeden. Steeden is also sometimes used in Australia as a noun to describe the ball itself. The ball used in rugby union, usually referred to as a rugby ball, is a prolate spheroid essentially elliptical in profile. Traditionally made of brown leather, modern footballs are manufactured in a variety of colors, patterns. 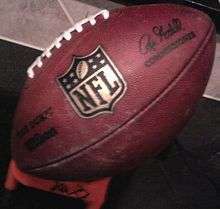 A regulation football is 28–30 cm (11–12 in) long and 58–62 cm (23–24 in) in circumference at its widest point. It weighs 410–460 g (14–16 oz) and is inflated to 65.7–68.8 kPa (9.5–10.0 psi). ↑ "Scottish Cup – World's Oldest Football". Homecoming Scotland 2009. Retrieved 30 May 2011. ↑ "Oldest football to take cup trip". BBC News. 25 April 2006. Retrieved 2 May 2010. ↑ "Collections – Stirling Smith Art Gallery and Museum". Smithartgallery.demon.co.uk. Retrieved 30 May 2011. ↑ "The NFL's centenarians". Profootballhof.com. 7 February 2010. Retrieved 27 March 2013. ↑ Scott Oldham (October 2001). "Bombs Away". Popular Mechanics. Retrieved 26 March 2013. ↑ John Maxymuk (2012). NFL Head Coaches: A Biographical Dictionary, 1920–2011. McFarland. Retrieved 26 March 2013. ↑ Barbara Rolek (27 October 2003). "Horween's leather bound by tradition". Chicago Tribune. Retrieved 27 March 2013. ↑ Horween Leather Company. encyclopedia.com. Retrieved 26 March 2013. ↑ Kerry Byrne. "'The Duke' is back!" (subtitle - "The white stripes")". Coldhardfootballfacts.com. Retrieved 3 August 2006. ↑ "Laws of the Game". FIFA. Retrieved 30 May 2011. ↑ Soccer Balls, Soccer, 2013-10-14. Retrieved: 2013-10-14. ↑ Flanagan, Martin. "Why Tom Wills is an Australian legend like Ned Kelly", Australian Football. Retrieved 7 November 2013. ↑ "International Australian Football Council". Web.archive.org. 23 August 2006. Retrieved 30 May 2011. ↑ "Official Website:: SalthillKnocknacarraGaa.ie". Web.archive.org. 3 May 2008. Archived from the original on 3 May 2008. Retrieved 30 May 2011. ↑ Simon Hawkesley. Official Richard Lindon Site. Retrieved 7 August 2008. 1 2 3 RLIF (2004). "Section 3: The ball" (PDF). The International Laws of the Game and Notes on the Laws. Rugby League International Federation. p. 8. Retrieved 30 July 2008. ↑ "Rugby Union: Law 2 – The ball". Web.archive.org. 15 January 2007. Archived from the original on 15 January 2007. Retrieved 30 May 2011.